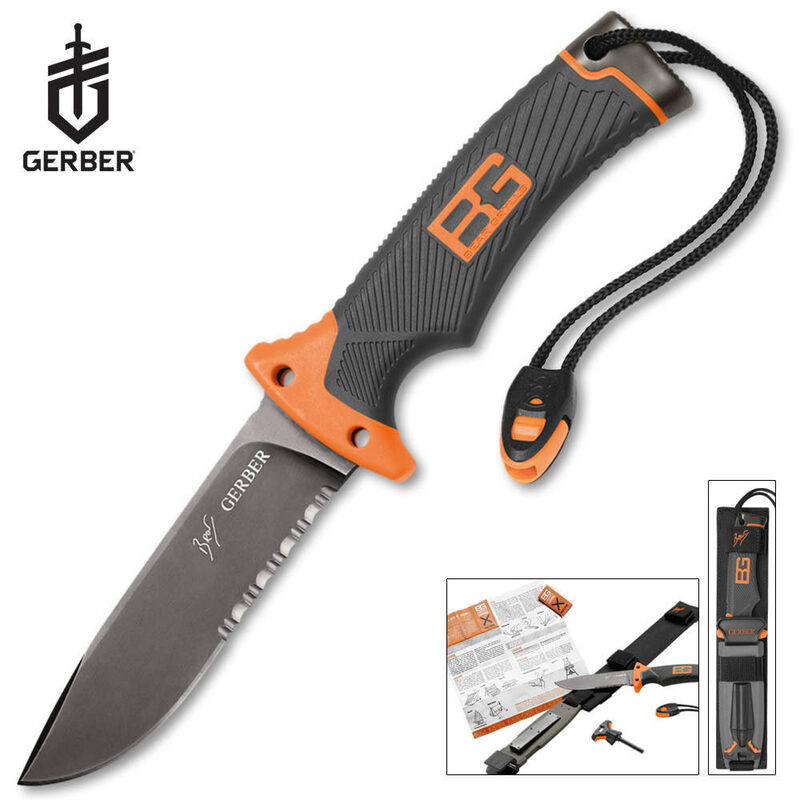 Gerber Bear Grylls Ultimate Knife | BUDK.com - Knives & Swords At The Lowest Prices! This a great item, thank you.. I am a 16 year old kid who has lived in the woods all my life and has been around knives almost every day of it. And all I can say is this a pretty sweet knife! I know people are giving it a lot of flack but I dont see why? I've taken it to the mountains and have put it through some serious work and it has held up amazingly! I do have to sharpen it now and then and yeah the serrations aren't amazing but good luck finding a better knife under 5$. The sheath has some pretty neat feature too. All in all a pretty sweet knife that you can take anywhere and be confident in your knife. This is an excellent knife. My brother bought one and I thought being that it was a "TV show promo knife", it was going to be cheaply made. I was surprised at how good it feels and how well made it is. I bought one. For starters, the handle is extremely comfortable and will not slip out of your hand. The blade is easy to sharpen, yet it holds a good to razor sharp edge. It is not a stainless steel blade (which I hate because you can't get that perfect edge). The sheath is not bulky, yet it holds a decent fire starter and has a diamond sharpener attached, which does an excellent job in sharpening. If you are a survivalist wannabee, you won't like it since it is not a 13"+ knife. However, if you know about the outdoors and want an excellent, cost efficient, multipurpose and functional knife, you can't go wrong; as a matter of fact, I think you might be impressed. Okay I got this knife a couple weeks ago and haven't really used it that much but its the best I've had, but like other people say the flint and steel are good mine is crap but the knife is good and I love the sheath. I have recently purchased this knife and can say that it being backed by BEAR is saying enough. Honestly I have nothing but good things to say about this knife. I first saw the knife in a commercial and didn't think much of it because I usually don't go for non-custom or new knives sold in retail stores. I was visiting my mothers house over the holidays and noticed my step father had received it as a gift so I picked it up out of curiosity. I was impressed immediately. The knife feels amazing in my hand. After getting it I took my 2 oldest out to the back property and I started to use it to break up an old dead log to use the core as fire wood.The knife impressed me further. It is extremely durable. I put it blade deep into the log an applied force to the handle using my foot and I was able to break away huge sections of wood away with relative ease.The amount of force that was applied would have broke most other knife blades that claim to be "survival knives". The knife is overall amazing. Very well made knife. I love the grip on the handle the sheath is great and the sharpening stone works well, but one thing I don't like is the half serrated blade I would like this knife a lot more if the blade was only 1/4 serrated, but over all great knife must buy. Great knife! Always loved Man vs. Wild. I've seen Bear use this knife on a few occasions in the show. It's a very good multi-use knife. The fire starter works very well and the blade comes quite sharp. Definitely 5 out of 5. When I saw this knife I thought it was cool, but I didn't want to buy only because it was made by Bear Grylls. But after reading reviews I really liked it. I got one for Christmas, and eventually got to try it out. We decided to test it out, and we easily got a fire going with the flint and knife. The sparks come out bright and hot. It is honestly the best camping/survival knife, with the right know how, you don't need a single match. And if your knife gets dull, you can sharpen it right there. Definitely worth the money.